Now is the time to look like the best version of yourself! 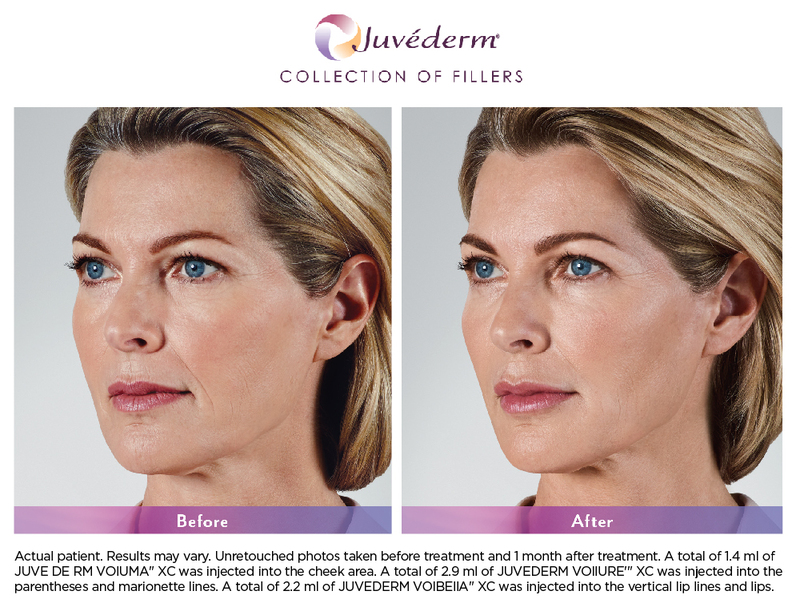 We use a range of FDA-approved cosmetic injectables to address the effects of skin aging and other aesthetic conditions. 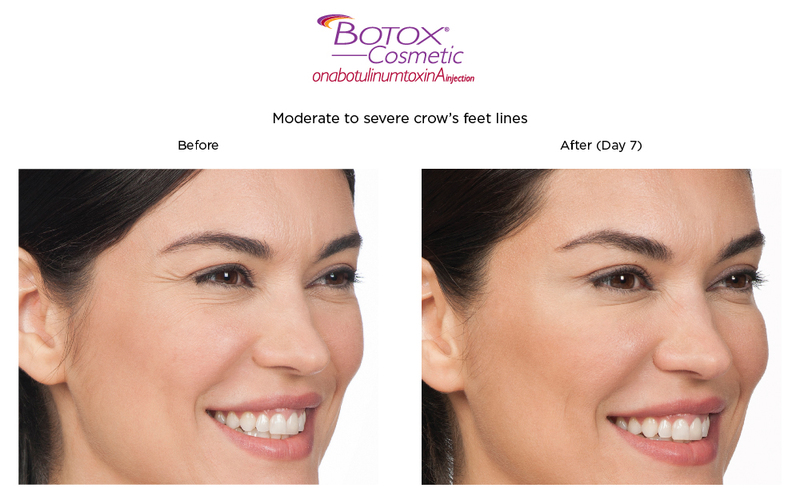 All Botox® Cosmetic and facial filler injectables are administered by our Nurse Injectors or Medical Director. 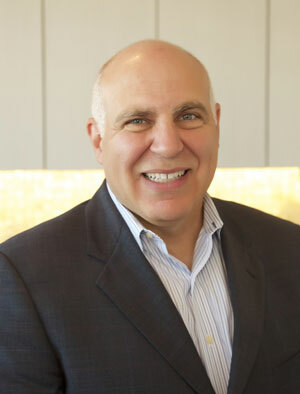 With their extensive backgrounds in facial rejuvenation, advanced clinical training, expertise, and an eye for aesthetics, they are able to help their patients reach their desired cosmetic goals in a safe and comfortable setting. 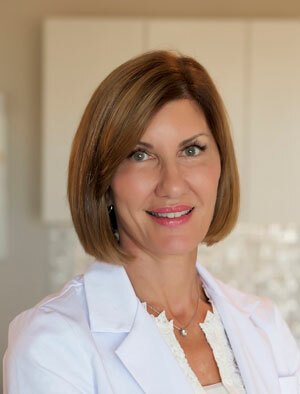 We invite you to schedule a consultation to meet a member of our MedSpa team to discuss your specific facial rejuvenation goals or learn more about our offerings. 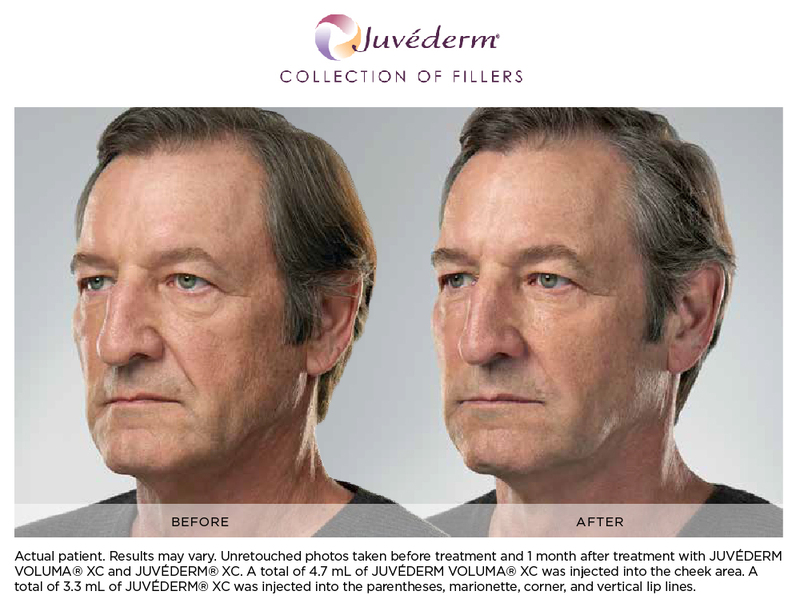 Required prior to your first injectable appointment. 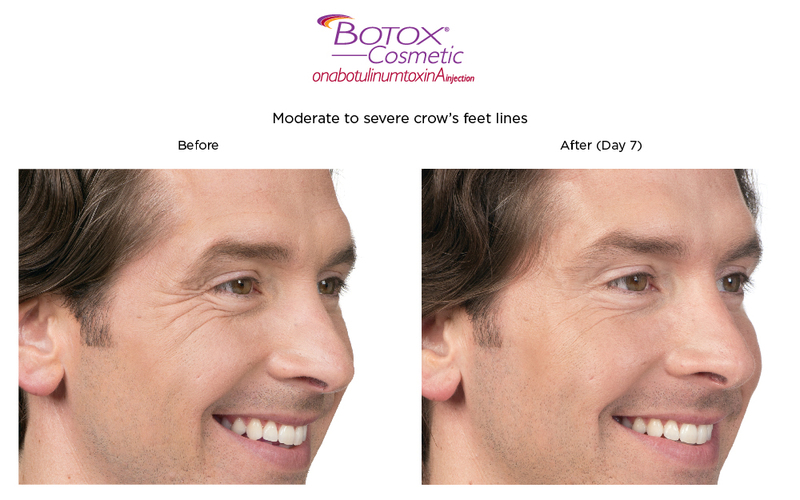 Temporarily improves the look of both moderate to severe crow’s feet lines and frown lines between the eyebrows in adults. Price is $13 per unit, with 20-70 units typically used. Lasts 3-4 months on average. 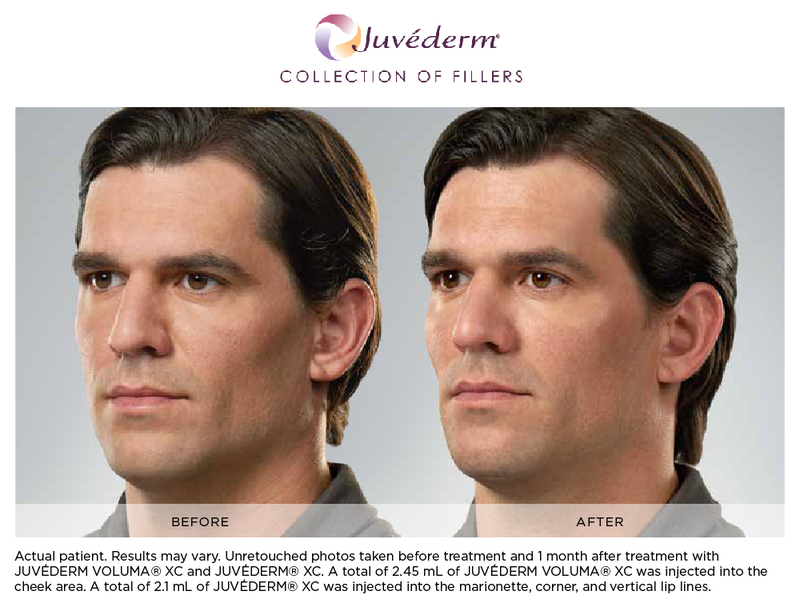 For lip augmentation and correction of perioral lines, often called “lipstick lines.” Lasts up to 1 year. Improves the appearance of moderate to severe fat below the chin (“double chin”). Permanently destroys fat under the chin to give a more youthful contour. 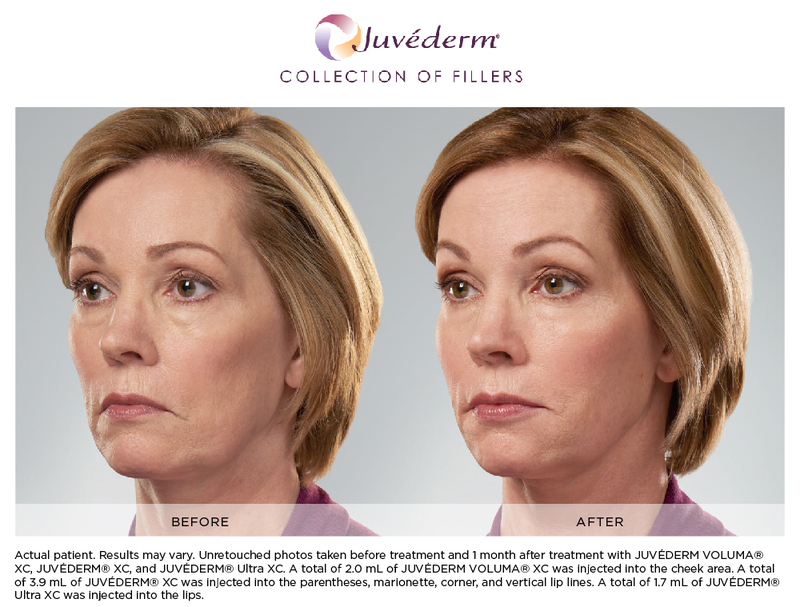 What’s the difference between Botox Cosmetic® and fillers? 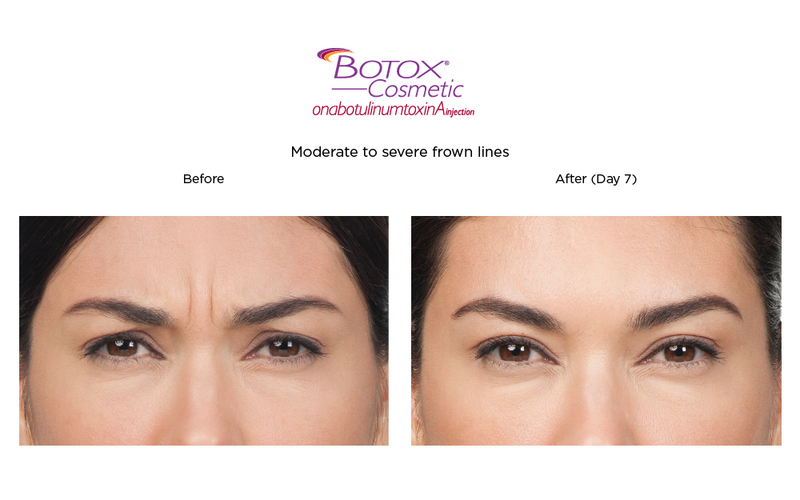 Botox Cosmetic targets one of the underlying causes of frown lines, crow’s feet and forehead lines — the repeated muscle contractions from frowning, squinting, smiling and raising the eyebrows over the years. 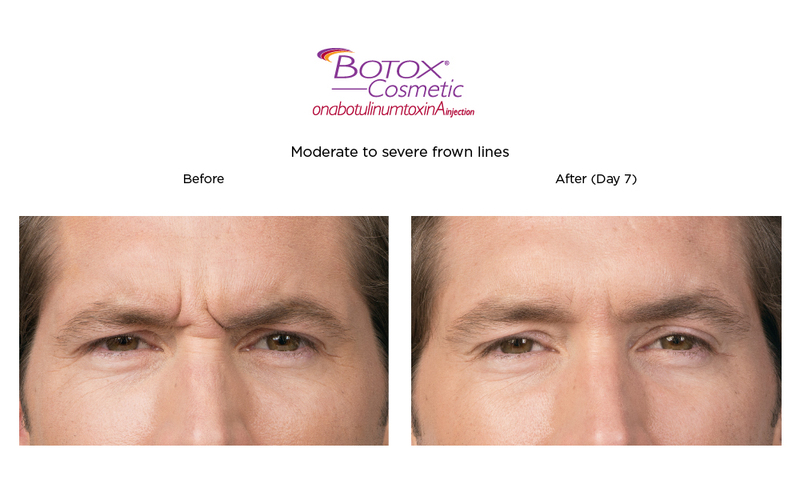 Your injection provider will inject these muscles with Botox Cosmetic to temporarily reduce muscle activity, resulting in a visible smoothing of these lines. 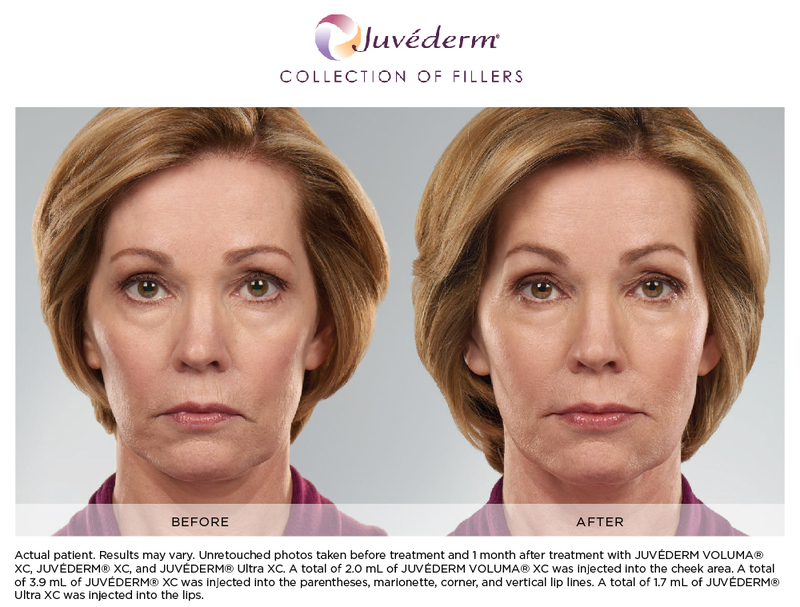 Fillers contain hyaluronic acid, a naturally occurring substance that delivers nutrients to the skin, helping the skin retain moisture and softness and adding volume. 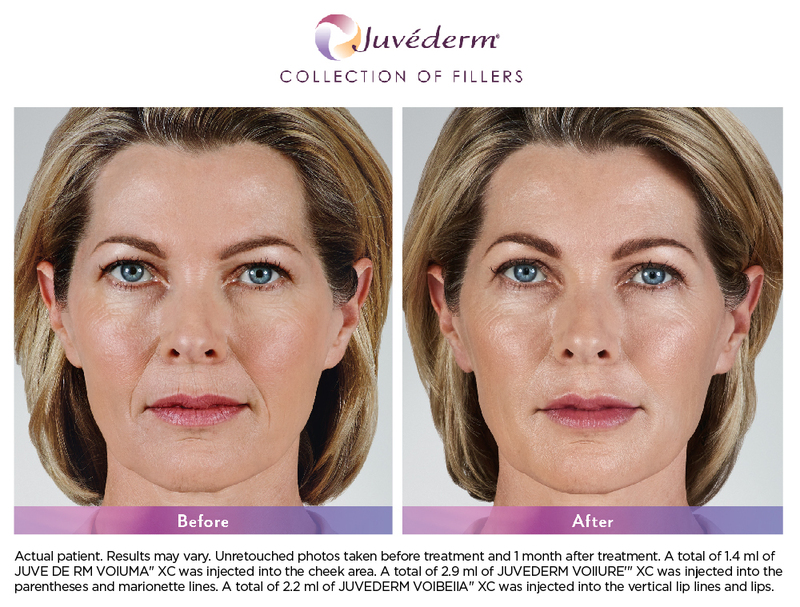 Each product in the JUVÉDERM® collection of fillers adds volume to a different area of the face, without surgery. 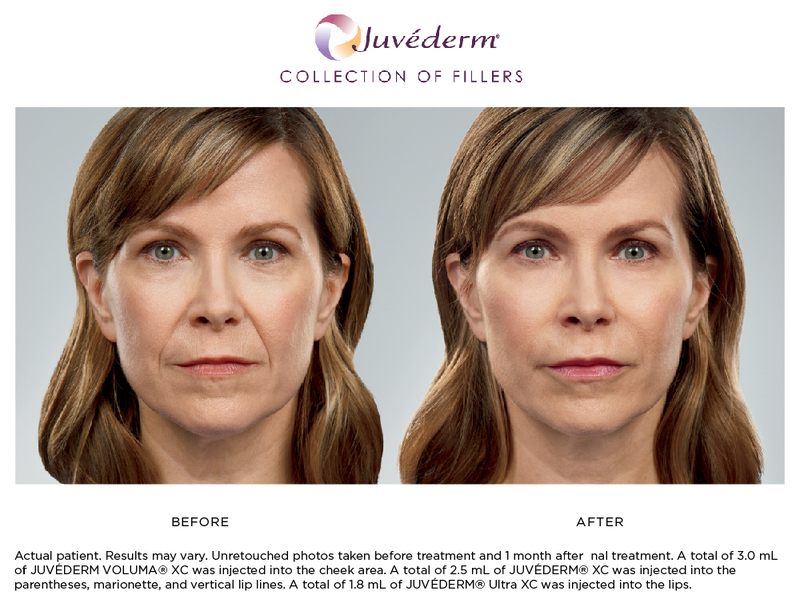 Botox results can typically be seen in 24-48 hours, and filler results can typically be seen immediately. That will depend on the product(s) used, area treated, and your own unique biology. Typical ranges can be found in the product descriptions above. Yes. Our goal is to rejuvenate your look and simply make you look like the best version of yourself. 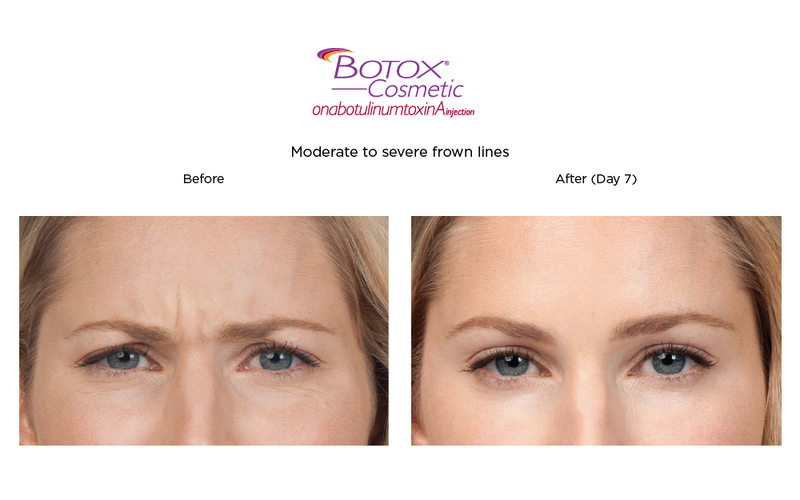 While Botox can dramatically improve your frown lines, you will still be able to clearly express all of your emotions. Your service cost will depend on your aesthetic goals and which products, and how much of each product, are required to reach those goals. This cost includes not only the price of the products, but the skill and expertise of our experienced Nurse Injectors and Medical Director. 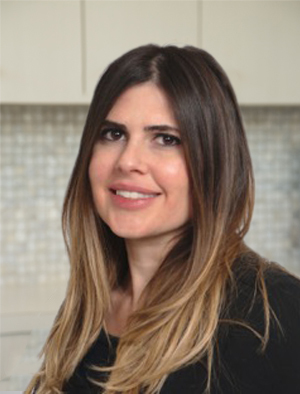 Our injectable providers take the time to understand your goals and develop a custom plan just for you, and can offer a price estimate after your consultation. Is there something else you’d like to know? Contact us with any questions by calling us at 978-465-3010, filling out our contact form below, messaging our Facebook page, or booking a consultation. 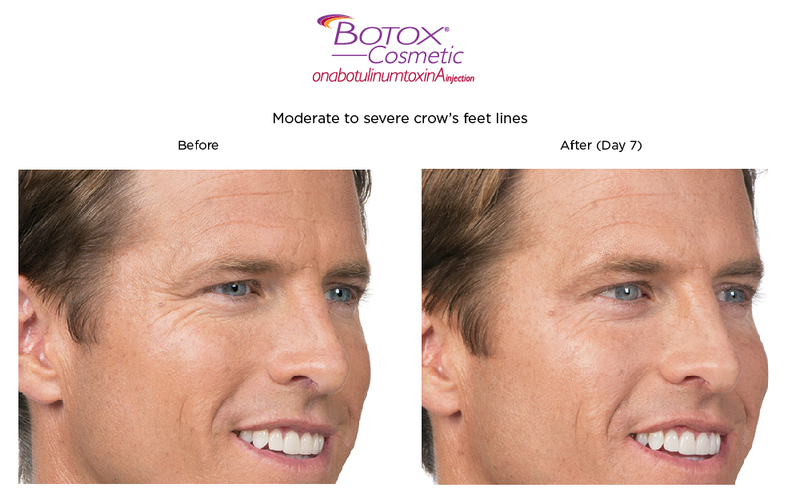 It is recommended to schedule Botox® injection 2-3 weeks prior to any special event or vacation. Discontinue the use of Aspirin, Motrin, Gingko Biloba, Garlic, Flax Oil, Cod Liver Oil, Vitamin A, Vitamin E or any other essential fatty acid at least 1 week before your treatment to minimize bruising or bleeding. Consult your primary physician prior to discontinuing any medications. Avoid alcohol, caffeine, Niacin supplement, high-sodium foods, high sugar foods, refined carbohydrates, spicy foods and cigarettes 24-48 hours before treatments. These items may contribute to increase swelling or irritation. If you develop a cold/flu, infection, blemish or rash in the area to be treated prior to your appointment, we recommend that you reschedule. Do not massage the injected sites for at least 4 hours. Contract the injected muscle 1 hour after injection. Must stay upright and not lay down for 4 hours after injection. Avoid heavy lifting, straining, vigorous exercise for a least 4 hours. Discontinue the use of Aspirin, Motrin, Gingko Biloba, Garlic, Flax Oil, Cod Liver Oil, Vitamin A, Vitamin E or any other essential fatty acid at least 1 week after your treatment to minimize bruising or bleeding. Consult your primary physician prior to discontinuing any medications. Avoid alcohol, caffeine, Niacin supplement, high-sodium foods, high sugar foods, refined carbohydrates, spicy foods and cigarettes 24-48 hours after treatments. These items may contribute to increase swelling or irritation. 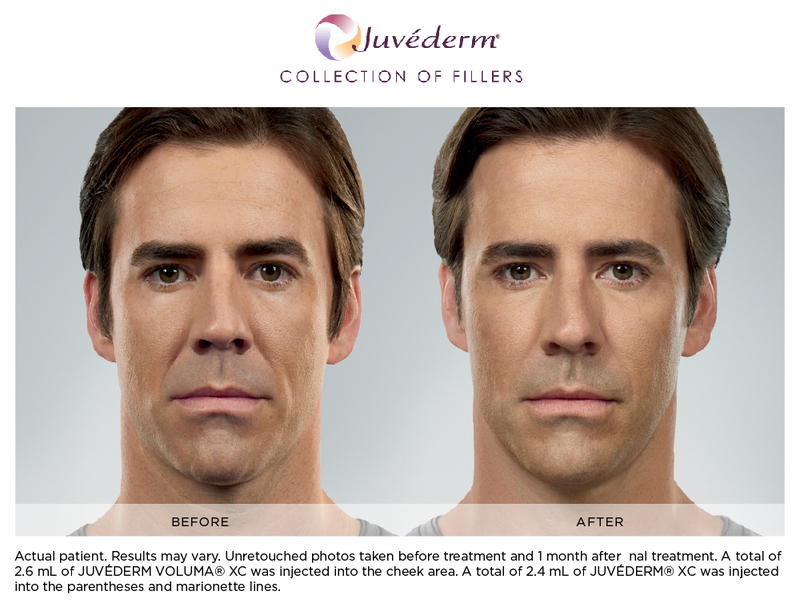 No cosmetic treatments such as laser, ultrasounds, peels, facials, or microdermabrasion for 24 hours. No makeup on treated area for 24 hours; earlier use may cause pustules. Avoid wearing hats or headbands for 4 hours. The treatment may take 2-10 days to take full effect. 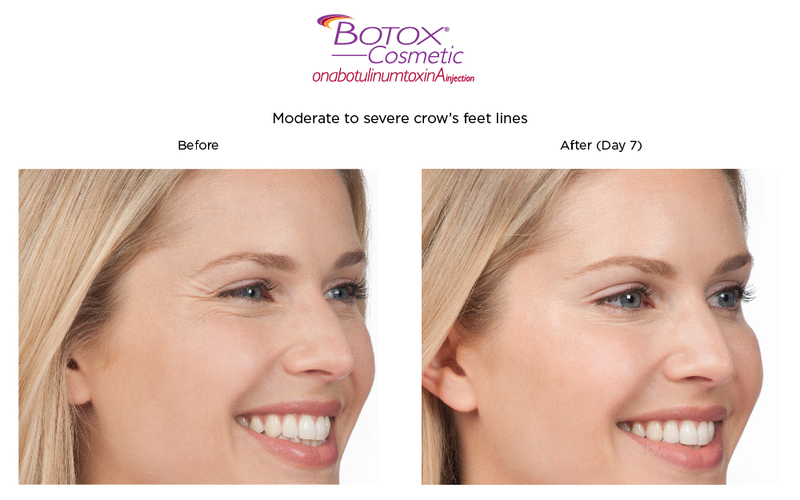 No additional Botox® injection should be repeated until 2 weeks after initial treatment. 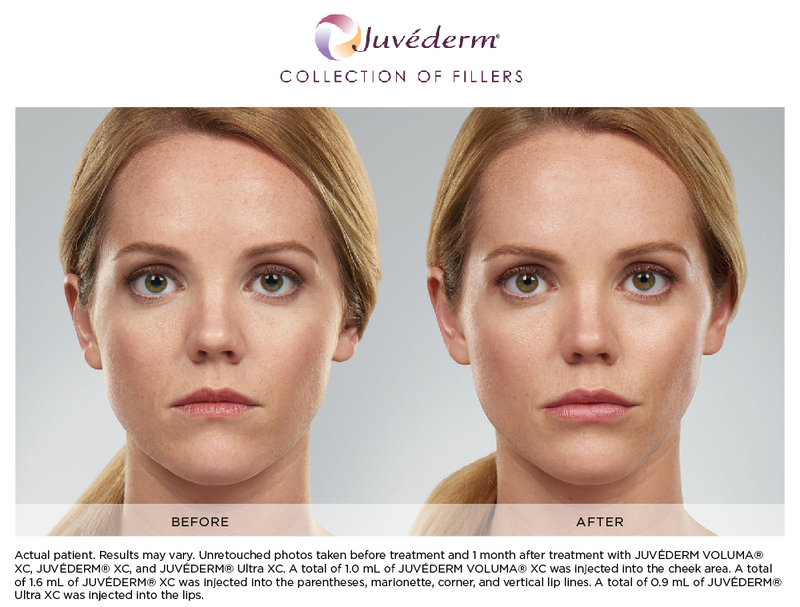 It is recommended to schedule your injectable aesthetic filler 2-3 weeks prior to any special event or vacation due to swelling and bruising post treatment. Caution is advised to persons with a history of herpes simplex in the treatment area. For those who carry the herpes simplex virus, it is recommended to be pretreated with a prescribed antiviral medication for a 3 days before and after each treatment. If you have an active herpes outbreak, your appointment will have to be rescheduled. Discontinue the use of Retin-A for 3 days before treatment to avoid any increased redness and irritation. Inform your Nurse Injector if you have demal fille treatments or have previously had cosmetic treatments with laser within the tlast 2 weeks. Patients should not schedule any invasive procedures for 2 weeks after treatment to treatment. Do not touch, rub, press, massage, or manipulate the injected sites for at least 6 hours. Avoid rigorous exercise, sun and heat exposure for 3 days after treatment. Avoid submerging head under water for 24 hours after injection. No cosmetic treatments such as laser, ultrasound, peels, facials or microdermabrasion for 2 weeks after treatment. Avoid makeup for 24 hours. Earlier use may cause pustules. Ice the treated area for the next 24 hours, every 20 minutes. Discontinue the use of Retin-A for 2 days after treatment. Avoid Aspirin, Motrin, Gingko Biloba, Garlic, Flax Oil, Cod Liver Oil, Vitamin A, Vitamin E or any other essential fatty acid at least 1 week before your treatment to minimize bruising or bleeding. Consult your primary physician prior to discontinuing any medications. Please call INTERLOCKS MedSpa if you have increased pain, swelling redness, blisters or itching. 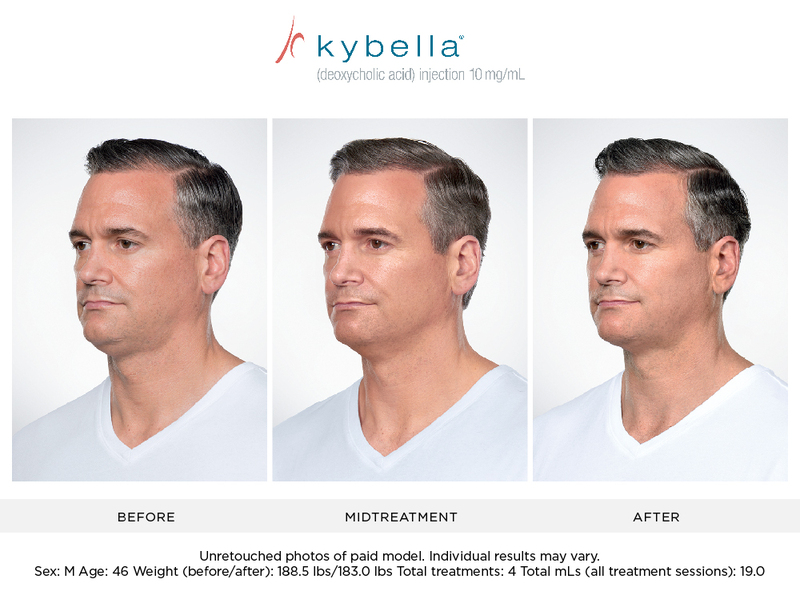 It is recommended to schedule KYBELLA® injection 2-3 weeks prior to any special event or vacation due to swelling and bruising post treatment. 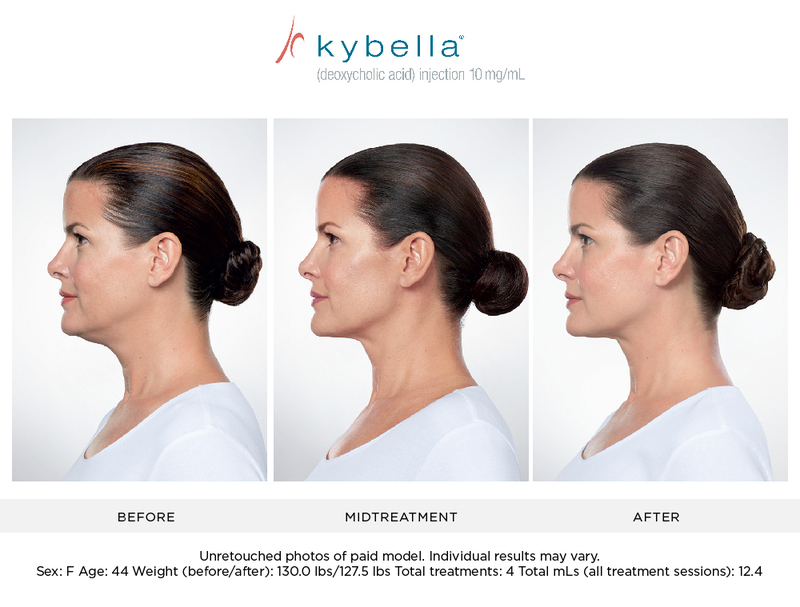 You cannot receive KYBELLA® if pregnant, or intend to become pregnant during course of treatment. 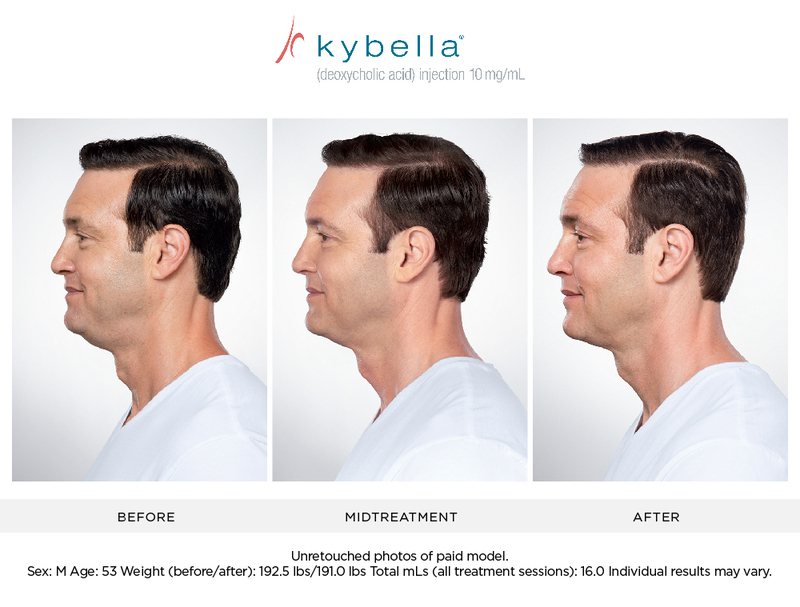 It is not known if KYBELLA® will cause harm to an unborn baby. 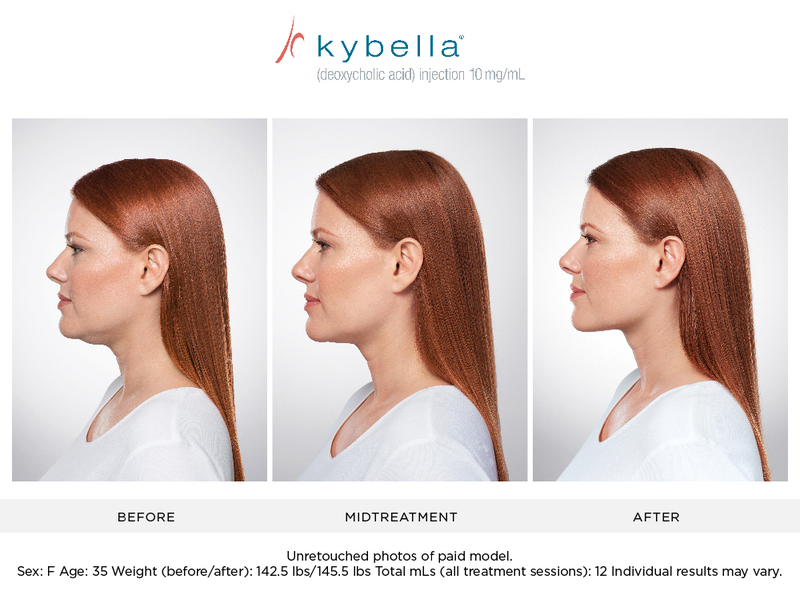 You cannot receive KYBELLA® if breast-feeding during course of treatment. It is not known if KYBELLA® passes into breast milk. Talk to your healthcare providers about the best way to feed your baby if you receive KYBELLA®. 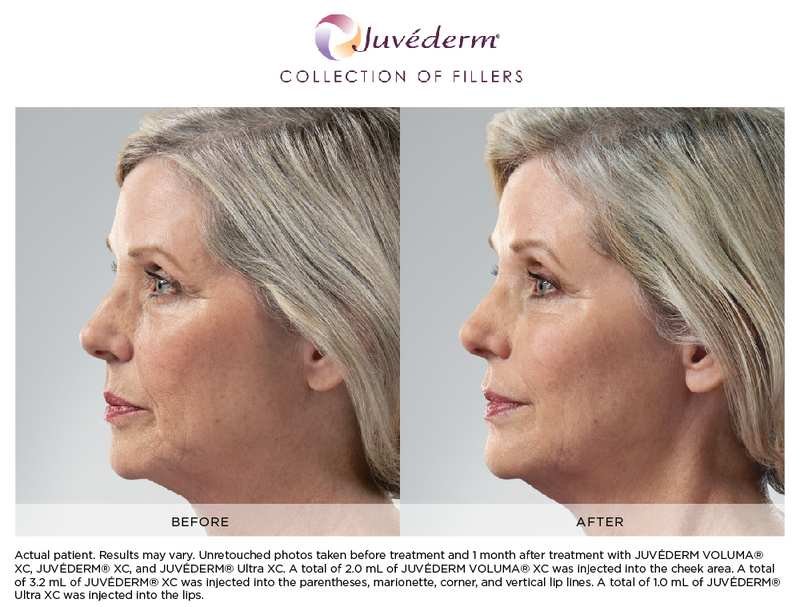 Tell your Nurse Injector if you have had or plan to have surgery or cosmetic treatments on your face, neck or chin. Notify INTERLOCKS MedSpa with any changes to your health history or medications since your last appointment. Do not touch, press, rub, massage or manipulate the treatment area. It is common to experience immediate swelling, bruising, pain, numbness, redness, and areas of hardness in the treatment area. Apply ice or cold pack to the treatment area for 10 to 15 minutes, as needed. Apply Arnica gel to the treatment area to help decrease bruising, swelling and discomfort. Must stay upright and not lay down for 4 hours after injection. Sleep on your back with head elevated for the next 3-5 days. Avoid rigorous exercise, sun and heat exposure (ex. hot tubs, steam rooms) for 3-5 days. 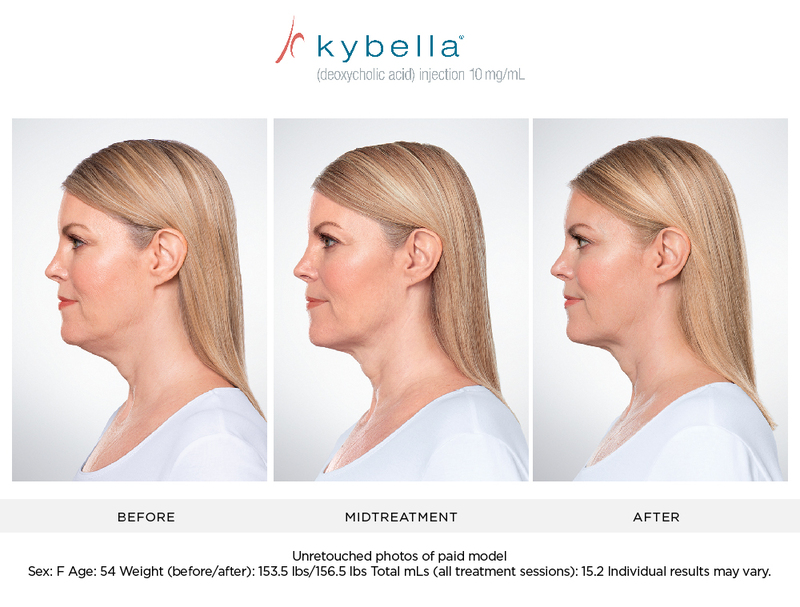 Avoid cosmetic treatments such as injectables, laser, ultrasound, peels, facials or microdermabrasion to the KYBELLA® treatment area for 2 weeks. Please call INTERLOCKS MedSpa if you develop an asymmetric smile or facial muscle weakness, skin ulceration in the treatment area, difficulty swallowing, or if any existing symptoms worsen.